Mount Kenya, the highest mountain of Kenya and the second highest of Africa (after the Kilimanjaro which lies just over the Kenyan-Tanzanian border), is at the centre of this national park of 715 square kilometers. The mountain an ancient extinct volcano and during it’s period of activity, believed to be 2-3 million years ago, it’s though to have been 6,500 to even 7,200 meters high. The big attraction of this park is hiking and mountain climbing, with breathtaking views over glaciers, lakes, tarns and peaks. But there’s also some superb wildlife and very unique flora to explore. While Kenya is normally hot to freaking hot, be aware that the temperature drops with each 100 meters you climb, and high up the mountains it’s freezing with permanent ice – only 16 kilometers from the equator. If you see this majestic mountain for the first time, it becomes clear why the Kikuyu (Kenya’s biggest tribe) think Ngai, their supreme God, lives on top of this mountain. The park is a UNESCO World Heritage Site since 1997. There are fascinating changes in flora and fauna as the altitude changes. The true mountain forest only begins at 2,000 meters and consists mainly of podo and cedar. The lower slopes are covered with dry upland fores. Above 2,500 meters begins a belt of bamboo forest. The trees here are covered with high altitude moss. As there are only few places in Africa with permanent ice, some unique flora which can only be seen at a couple of other places around the globe, has developed here. Sykes monkeys, buffaloes, black and white colobuses, elephants and bushbucks can be spotted in the park. Lower down, you’ll engage black rhinos, waterbucks, black fronted duikers, bush pigs, giant forest hogs, baboons, leopards, genet cats, and sometimes bongos (a type of forest antelopes). Some of the rare or endangered species that can be found here are skinks (lizards), mole shrews, sunni bucks, several owl species and occasionally albino zebras. 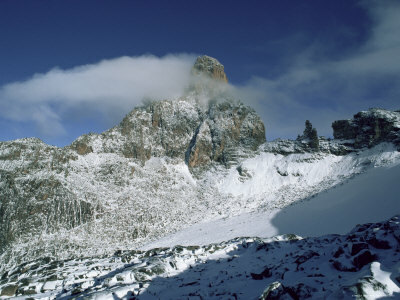 While the two highest peaks of Mount Kenya – the Batian (5,200 meters) and Nelion (5,188 meters) – can only be climbed by experienced mountaineers, the third peak (Point Lenana, 4,985 meters) – can be reached by hikers. This peak offers a magnificent view over the park. However, don’t do this if you are untrained, preferably hire a guide and take all necessary equipment with you (you can also hire porters to carry heavy equipment for you). There are mortal accidents each year. Also allow enough time (2-3 days) for the descent, or otherwise you may get altitude sickness with nausea, headaches or worse. There are at least seven different routes up Mt. Kenya, Naru Moru being the easiest and most popular, Sirimon and Chogoria which offer excellent alternative and the exciting but demanding Summit Circuit, which circles Batian and Nelion, thus enabling you to mix and match ascending and descending routes. 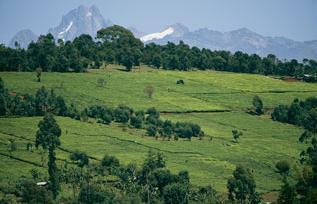 If you want to climb Mount Kenya, you can hire good equipment from Naro Moru River Lodge. Good guides, cooks and porters have permits from KWS (Kenya Wildlife Service) and carry identity cards. They can be hired for between $8 and $15 a day from e.g. the Mount Kenya Guides & Porters Safari Club or the Mountain Rock Lodge in the park. If you have a tent, you can camp anywhere in the park. The only practical advantage of the official campsites is that they have water pipes and “long drop” toilets. Around the peaks, there are huts which make it theoretically possible to spend some days in this high mountain area. However, they are in a bad condition. Some other places to stay which can be recommended are Mountain Lodge (run by Serena Hotels), Rutundu Fishes Lodge (run by Let’s Go Travel), Batian Guest House and Sirimon Bandas. The nearest airstrip is Nanyuki. Entry fees are $20 for adults, $15 for children.